In 1952 the Nuffield Organisation and the Austin Motor Company merged to form the British Motor Corporation, however this was seen more as a takeover by Austin. Lord Nuffield was retained in an honourary position as president of BMC until his death in 1963, but it was Leonard Lord, Austin's chairman and managing director who was in total charge of the corporation from the outset. It was well known that he would personally have liked to have killed off all the Nuffield marques of Morris, Wolseley, Riley and MG in favour of Austin. Because Nuffield and Austin dealers had had such close ties in the past and due to there being so many of them, it would have been very costly to compensate those dealers who would have lost their franchises, which would have been a necessary step if all BMC products only carried the Austin badge. BMC could not afford to adopt this course of action and Lord came up with an ingenious idea which became known as "Badge Engineering". This meant that in future BMC would produce basic models which could be adapted with different marque badges and trim at very little extra cost. This was a clever move, as it created the impression that the cars were quite different from each other. It worked well with Austin, Morris and other relevant marques but not so well with MG, because in the past most models had been unique to MG. In view of the exceptional sales achievements of MG in past years, Lord could not afford to overlook the potential and decided to do the same thing with MG, whilst allowing the cars to retain more of their own identity closely connected to at least one other car in the BMC range . The first move in the rationalisation plan was to scrap Nuffield engines, utilising 'A' and 'B' series engines in many cars. At the same time work started on standardising bodyshells. 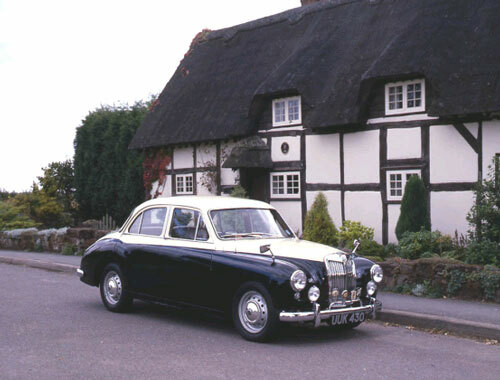 The Wolseley 4/44 was launched in 1952 with the XPAG 1250 cc engine and was modified to take the 'B' series unit with MG radiator and badging to become known as the Z series Magnette. Introduced in October 1953, the name Magnette was revived having last been used in 1936. The car was introduced at the 1953 Motor Show alongside a new version of the MG TF. The ZA Magnette was really a replacement for the YB saloon which had sold well but had very rapidly become dated. However, a thinly disguised Wolseley that was being presented as an MG upset a lot of MG purists, and there were many lively exchanges in the letters columns of the leading motoring journals of the time! "A perversion of the famous name" was one such comment that was commonly heard, but many had forgotten that the first Magnette was a saloon aimed at a very similar type of customer. The Magnette was completely different to any previous MG and was to many people a pleasing saloon of Italian design origin. It was the first MG to employ a body of monocoque construction, that is to say it was not built on a separate chassis, with the bodyshell providing mountings for the engine, gearbox and suspension. This type of construction was rapidly becoming popular in the 1950's in view of the fact that the whole car could be made much lighter but still retaining strength, also when mass produced, the unit costs dropped dramatically. One of the advantages of this type of construction was that the passenger compartment floor could be sited much lower in the vehicle, along with the engine and drive train, thus giving a lower centre of gravity, producing far better handling. This very comfortable 4 seater had independent front suspension with wishbones and coil springs and a live rear axle located by a torque arm. This torque arm was needed because rubber bushes were used extensively in the suspension mountings to reduce noise, improve the quality of ride and reduce maintenance. Altogether the car was very civilised larger SU carburettors. Being capable of over 90 mph the ZB Magnette became the fastest 1.5 litre saloon available in Britain which was endorsed by the fact that it won its class in the BRSCC Saloon Car Championship in 1958. The ZB also displayed several interior detail improvements over its predecessor and was also improved styling-wise with the Varitone model. This employed a two-tone colour and became an immediate success despite the criticism it received upon its launch. With the new 'B' series 1498 cc engine, the Magnette was far faster than the Wolseley, producing 60 bhp @ 4600 rpm. This engine was not liked initially at Abingdon, but was soon to demonstrate versatility and reliability through its enormous tuning potential. The car also easily out-performed its YB predecessor, due to the excellent roadholding characteristics and was to obtain commendable results in international rallies and production car races later on. The new Magnette sold well at around 6000 units per year, with its luxurious leather interior and 'octagonal like' instrumentation, customers loyal to the marque soon warmed to the car. The introduction of the Magnette heralded the start of a revolution at Abingdon in which the factory changed from being a works where cars were built from hundreds of small components to one where they were simply assembled, in much larger quantities, from a few larger components, such as complete bodyshells, produced by outside suppliers. When the production of the Magnette was well under way, Abingdon turned their efforts to the production of the all-new MGA which was launched in 1955. Whilst the MGA was happily furthering the MG tradition, the ZA Magnette saloon was coming to the end of a life during which it had done much the same things, although in a totally different market sector. At the latter end of 1956 the ZA Magnette gave way to the ZB Magnette, with major differences in the power unit. The engine now produced 68 bhp @ 5500 rpm, due to increased compression ratio and scheme and a larger wrap around rear window which apparently was installed by cutting a larger aperture at the Abingdon factory, as the Pressed Steel factory at Cowley, where the Magnette shells were made, never tooled up for this design improvement. A small number of ZB Magnettes were produced with clutch-less 'Manumatic' gear changes, which was an early attempt at providing a semi-automatic transmission for the lighter small capacity saloons. Like so many MGs, the Z series had been introduced to howls of initial disappointment, yet proved itself to be a thoroughly capable and much admired car, with over 36,000 examples being produced. Power output: ZA: 60 bhp at 4,600 rpm. ZB: 68.4 bhp at 5,250 rpm. Brakes: Lockheed hydraulic with 10" drums. Number Built: ZA: 12,754, ZB: 23,846.